I had an unexpected moment of grief this summer. Of course, all grief is unexpected. We don’t know when it will hit or how we will react or how long the tears will well up in our eyes when we mention our loved ones names. I had an unexpected moment of grief and an unusual moment of grief this summer. And now I am left to say Kaddish not only for one person but for an entire family. 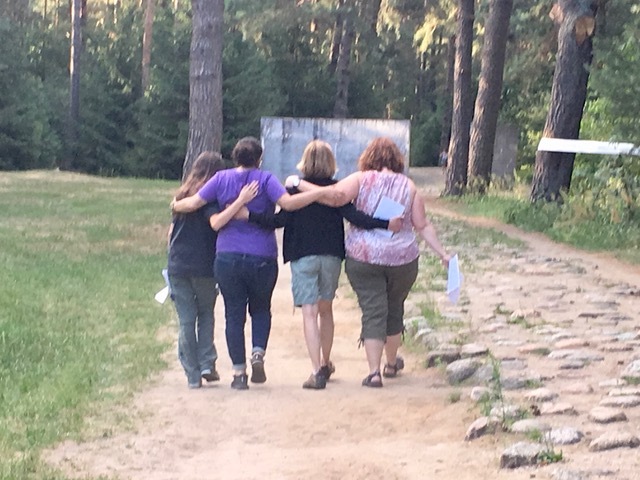 When I signed up for a fourteen day educator’s trip to Germany and Poland I knew the trip would be hard – twelve hours of day of visiting memorials and museums, ghettos and forests, concentration camps and death camps. And yet, I worked so hard to find this precise trip, to apply to the trip, even to find some grants to help pay for the trip. This program was precisely the way I wanted to encounter Holocaust history. I wanted to study and learn the lessons from experienced historians and learned guides. I wanted to confront the past of our people so that I could be a teacher, rabbi and professor who could better transmit the lessons to our students of the future. I never imagined that the loss I would confront would be so personal and so profound. The truth was she didn’t meant just Auschwitz. She meant any place of devastation – and we would visit so many of them. Yet my moment of deepest despair was not Bergen Belsen or Ravensbruk or Sachsenhausen or Auschwtiz-Birkenau, Belzec, Majdanek, or Treblinka all of which made my stomach and my soul sick. My moment of falling apart was on the streets of Berlin. You see I was told at a young age that I was named Judith for my grandfather’s sister Judith. That was all I knew throughout the first three decades of my life. Then when I was 32 years old, I became pregnant with my Maxwell so I delved a little more deeply looking for names of those who perished in the Holocaust on my family tree. I learned that my namesake, the Judith for whom I was named, was a rebbetzin, a rabbi’s wife, a teacher of Judaism. Unknowingly, I had become a teacher of Judaism just like my namesake. Unknowingly, I was honoring her memory through my life’s work. I always assumed the Judith for whom I was named was old when she died because after all, that is what great aunts usually are. I learned on the sidewalk of a street in Berlin that I was wrong. I always heard that she died in Auschwitz. I learned outside the home where she lived that I was wrong about that, too. The family tree I have with her name in my scrapbook and to which I often refer shows only her and her husband. I learned as I sat in front of the park where I imagine her kids once played that I was missing the most significant part of her life. On June 7th, nine days before my departure an email arrived in my inbox. It was to all my siblings and me asking if any of us could make it to Berlin on June 14th for the dedication of Stolpersteine – the memorial stumbling stones that would be placed in the ground in memory of Judith Schindler Steinberg and her family. None of us could make it on such short notice but I was comforted in knowing I’d be there just two weeks later. Stlopersteine represent the largest Holocaust memorial in the world. They are 4 inch by 4 inch bronze cubes placed in front of the home where a Holocaust victim lived telling of their deportation and death. There are 67,000 Stolpersteine in 22 countries. And now the stone with my name, not for me but my namesake, would be placed. I wrote Elaine and asked if I could leave the group to say Kaddish at these newly placed stones and she said it would be good for the group to join me. On July 2nd, the bus driver in Berlin made some minor detours to find my family’s address Alte Schondhauser 53. We got off the bus and walked about a block before one person from my group found the stones in the sidewalk. One teacher poured water on the stones and another cleaned them so they would be shiny. She was 32 years old. with the same dates of deportation and murder. all deported to their deaths on the same day. and little Hannah who was just two years old. As I read each stone, an unexpected grief rushed through my entire body. Our guide and historian filled me in on my family’s fate. The ghetto in Riga was not ready in September of 1942. After a three day journey in cattle cars with 783 other passengers, Judith Schindler and her immediately family were shot in a forest outside Riga, Latvia. A powerful wave of despair washed over me. Judith Schindler was young. She had five young children. Together they were transported to Riga. Together they died. I think about them often. About their last years in Berlin. About the faith it must have taken to have a fourth child in 1938 and a fifth child in 1940. I think about their three day journey in the cattle car. About their last moments: Were they holding hands? Were they hugging when they died? I am sure they were saying the shema which I said before going to sleep each night at each of their children’s ages. At 32, the German Judith Schindler’s life as a mother ended. At 32, I got married and within the next 17 months would be giving birth and my life as a mom would begin. At 32, her role as a rebbetzin, a teacher of Judaism ended. 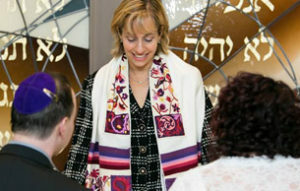 At 32, my role as a rabbi of this congregation began. Unexpected grief hits us and holds us and devastates us. But we must get up from that spot – that stone – and live. Unexpected grief should direct us. We must get up from that spot – that stone – and live not just for ourselves but for our loved ones .. whose names and whose stories and memories and life lessons and love we carry. Perhaps that is one more reason why we leave stones on graves – to leave the weight behind us as we move forward. In Judaism, memory is a commandment. Memory is active not passive. Memory obligates. I have always heard it said that when your parents die, you lose your past. When your spouse dies, you lose your present. When your child or grandchild dies, you lose your future. You each enter this service of Yizkor with a different devastation – for some the pain has softened, for others the wounds are raw, the pain is searing, the burden is heavy, the broken shards seem so many and so great it is hard to imagine when and how the picture of our lives will ever look presentable. We cannot foresee a time when a social media post or photo will show not our emptiness but our fullness, not our sadness but our joy, not our grief but our gratitude. “Never enter a place of devastation alone and never leave it alone,” Elaine, our Program Director dictated. And I say the same to you. Reach out to others – extending hands or hugs or cards or calls. They make a difference and help healing to happen. Ask about and hear and share each other’s stories and sadness and struggles to move forward. “Zachor – remember,” our faith commands. Ask yourself, what does the memory of my loved one command me to do? For what did they live? Whom did they love? What was their life passion that I can pursue in my own small, yet significant way? Yizkor calls us to counter that common wisdom: we cannot lose our past, present and future. Yizkor calls us to mourn, to cry and in the face of our losses to move forward. Yizkor Elohim – God, remember. Yizkor Elohim nishmot y’kireinu – God remember the souls of our loved ones and enable us to remember not only with tears and silence but with actions that bring meaning to their lives and to our own. Hamakom y’nachem etchem b’toch shar aveilei tzion v’yerushalim – may God comfort each one of you among the mourners of Zion and Jerusalem.